Come on out for a Free Sampling Event of Great Lakes Brewing Company. We will be sampling out some of their finest year-rounds & seasonal offerings. See you there! 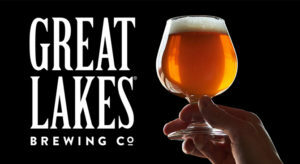 AND REMEMBER: ALL Month Long, we are featuring Great Lakes as our Brewery of the Month. Pre-Made 6-packs for $12!!! Two Irish brothers with limited brewing experience. In 1986 when Patrick and Daniel Conway opened their fledgling operation in Cleveland’s Ohio City neighborhood, the odds were stacked against them. Fortunately, they surrounded themselves with a staff of passionate, knowledgeable people, and from the start committed themselves to bringing a sophisticated, diverse selection of craft beer to their home state. Two decades, multiple awards, and a whole lot of stories later, Pat and Dan Conway celebrate over two decades of brewing exceptional beer for their adventurous and discerning customers.